Michael Scott, meanwhile, found his control. Much of this final season has been about nudging the Halperts in a similar direction. That latter plotline is put on hold tonight, however, all the better to suss out who among the Dunder Mifflin staff is fit to do the whacking, and who’s doomed to always be whacked. Or to use the giant nautical metaphor at the center of “The Boat,” who has the fortitude and the smarts to be a captain, and who’ll always end up doffing their shirt and pants for the privilege of swabbing the deck. Dwight Schrute, for all his pretensions toward authority, is a born follower. It’s his comedic essence: As “The Boat” demonstrates, he’s the guy who’ll feign control of Dunder Mifflin while also giving in to the demands of the pushiest, most suspect phone call this side of Compliance. Mileage with Dwight’s plot/plight tonight varies depending on your tolerance for the character’s most extreme behavior, but the way he responds to the radio-interview prank (and Rainn Wilson’s commitment to that response) are true to his contradictory nature. For an added dash of continuity, the final beat of the storyline shows that he never stopped collecting the cellphone numbers of his superiors. Because if a disaster is about to occur in Scranton, Dwight Schrute will save the day by sending a distress call up the chain of command. Dwight’s actions in “The Boat” square with his depiction throughout The Office—while lacking some of the sympathy he’s acquired in recent weeks—and, surprisingly, so do Andy’s. If there’s an attribute running through the multiple versions of Ed Helm’s character that keeps him from being a complete cipher, it’s his selfishness. This is yet another area of overlap in the Andy Bernard-Michael Scott Venn diagram, but that comes with the territory of being written as the nominal leader of the office. Michael gradually learned the virtues of selflessness, to the point where sacrificing his work family to start a family family with Holly felt like an organic move for the character—and whatever Andy finds when he returns from his maiden voyage as captain of the Aspire II could prove a similar “new life” epiphany. Because whatever daddy-issue-solving treasure the Bernard family’s newly appointed Michael Bluth is trying to find on the way to Bermuda (or the Bahamas, whichever), he decided he didn’t need to share it with Erin. As the Bernard brothers set out to sea, Walter Jr. picking out the opening chords of “More Than Words” and Andy wearing a cable-knit sweater he haggled off a sailor, Dan Sterling’s script makes good on previous hints that Andy and Erin’s story won’t end like Jim and Pam’s. “The Boat” jumps from one crisis to another, in a way third-time director John Krasinski infuses with just enough energy not to feel overwhelming—and with an emphasis on saving sinking ships that must, in part, be a personal statement from recently installed executive producer Sterling. But as bad as The Office’s eighth season got, it was never in as dire shape as the Bernard family’s finances. In fact, Dwight’s panic over an invented stock plunge for Dunder Mifflin can be read as a comment on the most hysterical reactions to the show’s inevitably diminished returns. Yet tonight’s episode manages to balance the qualities common for a sitcom nearing the end of its run (straining to serve an expanded cast of characters; a broader sense of humor and the storylines that produces) with the smaller, interpersonal material that makes us want to see these characters take the wheel. That’s present in Erin’s compulsory shore leave, and it’s present in Kevin and Oscar’s dilemma as well. It’s frustrating that The Senator still hasn’t been forced to pay the piper (and frustrating that Oscar can’t meet a decent guy for once), but this story is only turning the page from its second act to its third. “The Boat” manages a clever head fake when Oscar pulls away from The Senator’s touch, bluffing toward The Big Reveal before Kevin swoops in to cover for his co-worker and quasi-friend. To put it in terms of my favorite second act of all time, The Empire Strikes Back, Kevin trotting out the “USA” chant is like Luke Skywalker being “saved” by the breached air shaft on Bespin. Luke’s right hand (or Oscar, The Senator, and Angela’s right hands, rather) isn’t lopped off until the talking head that follows, where Brian Baumgartner unleashes that torrent of giggles as his character realizes Angela’s “life is a complete sham.” That’s some cold, dark humor, foreshadowing a “No, I am your father” moment from Oscar or The Senator sometime around the upcoming election. 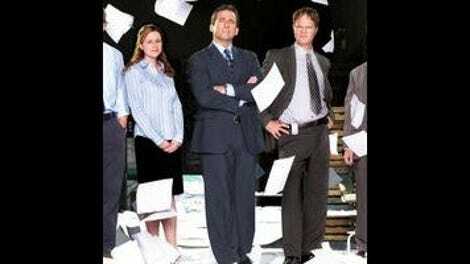 There was a time when The Office similarly delighted in the parts of its characters lives they could not control. It’s in the show’s DNA, and coming to terms with endless toil was once one of its most dependable sources of laughs. It was to the show’s advantage that its jaundiced perspective softened as the writers, producers, and actors grew to know their characters, but it’s invigorating to see the show balance its light and dark sides (can’t get away from those Star Wars analogies—go back and mentally replace all mentions of boats and ships above with “Millennium Falcom”) the way “The Boat” does. There’s venom in that last Kevin talking head as well as the collaborative prank pulled on Dwight. That venom is offset, however by the sense that Erin’s decision to join Plop (and Plop’s friend, Flipper) at Poor Richard’s is also an act of seizing her own destiny—a destiny that’s not beholden to a doofus being blown toward the Caribbean on the winds of the most dickish power ballad of the 1990s. She’s doing what she’s been asked to do, but by returning to Scranton, Erin’s performing more course correction than any of the navigational moves that the Bernards will pull aboard the Aspire II. There’s a lot to get through in the main portion of the episode, and that necessitated a brief cold open. Even taking this into account, the segment lasts just as long as it needs to, relying on a solid visual gag and great reactions from Brian Baumgartner and Oscar Nunez to send the whole thing home. “The Boat” depicts a chaotic day at Dunder Mifflin, but the episode does a great job of visually binding its multiple threads. The break room provides the intersection of the prank and affair plots, with Kevin (in follower mode) complying with the “no shirts with buttons, no pants with metallic zippers” rule—but only after unclothed Dwight is seen in the background of Kevin’s meeting with Toby. In light of that smooth transition, there has to be a deleted crosscut where Toby sees shirtless Dwight, gets out of his chair for a second, then lets out a resigned sigh and resumes his work because what yet-unused weapon in the HR arsenal could possibly stop such nonsense? Here’s hoping Toby’s theory about The Scranton Strangler was just a throwaway punchline. Either that, or a tease for the upcoming backdoor pilot for Toby Flenderson, PI.